rocky's bru: The "Gentleman" YB is back! Two years ago, some people wanted us to believe that Shaziman Abu Mansor, who was Works Minister, had been "dropped" from Najib Razak's Cabinet. Well, I hear the man's back, recalled to fill a void in PM Najib Razak's Administration left by the late Jamaluddin Jarjis. I used to be skeptical of this MP of Tampin but by opting to leave his ministerial post to focus son his Constituency after the last general election, thus allowing others a shot at the Cabinet, Shaziman confirmed he was far from selfish, the kind of man a the Prime Minister badly needs around him now. He once proposed a mandatory registration for bloggers so as to make everyone in cyberspace accountable for his action and word, but we were all dead against it [I'm a gentleman blogger, 23/8/2006] because we suspected it was a trick to curb freedom. With the benefit of hindsight, I think the idea was just a little ahead of its time. Shaziman would fit right in if Najib decides to do a Cabinet reshuffle. Like right about now is the right time for that long-overdue reshuffle, seeing that we are exactly half-way the current 13th Parliament. Many people I spoke to think the PM should let someone else be the MoF (but not his younger brother Nazir). One CEO blogger says it should be this someone else. Who should be OUT and Who should be IN? Yes, no brother brother thing. 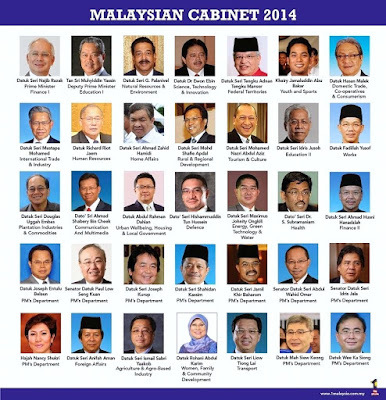 This is not Tunku Abdul Rahman's first cabinet where two brothers can be Ministers. Since Nazir is planning to start another political party, let him earn his Ministership. For too long, he has been a juara kampong banker gloating on meritocrasy but all along he had been a beneficiary of businesses from GLC, Government Institutional Investors and government friendly high networth individual. Among ministers who should be out Rocky? ho ho ho ... sack the most cumbersome one lor! At first I do not understand, why Rocky is not too bothered about 1mdb. I think I do now. And then now this guy shariman. Its going to be a really happy home coming! It does not matter who are appointed into the cabinet, the end of Umno's rule is over at the end of this term. Even though Umno should have been out of Putrajaya but they hung on in spite of being a minority elected government. Therefore all the decisions they made thus far do not reflect that of a majority elected government. Or are they saying they will still remain in Putrajaya regardless of the outcome of the election. Najib is planning to be like his late father to use emergency rule to do that when Umno could not be elected democratically in Selangor in 1969 ? But this time round he has got the jail bird Dato Harun, the repugnant and avaricious Mahathir and his late father to do that anymore. Day by day both of you have lost respect of your readers.